Set at the foot of a steep, south facing, tree clad sand bank; a long, narrow jetty structure is inserted into the bush with minimal impact on the slope. 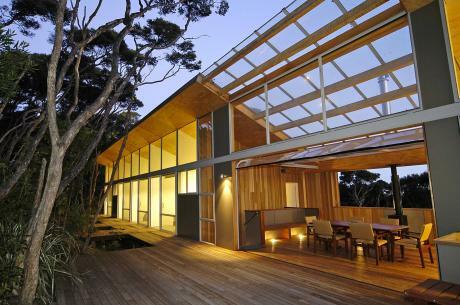 The building is a platform from which the owners can indulge in their passion for the bush environment. Large sliding doors, bridges & decks reach out like fingers into the bush reinforcing the connection between the landscape and the living environments. The roof is pitched up, gesturing upwards to the slope, the trees and the northern sun. A central glass roofed breezeway extends the living spaces as a protected indoor/ outdoor deck. The highly glazed northern façade is naturally sun-protected by the Manuka covered knoll. In contrast the southern façade is closed down with its back to the weather. The cladding wraps around the shoulders like a Driz-a-bone coat with the sliding shutters in the breezeway acting as the ventilation flap. The naturally weathered vertical cedar boarding on the protective southern wall reflects the verticality of the surrounding Manuka tree trunks.